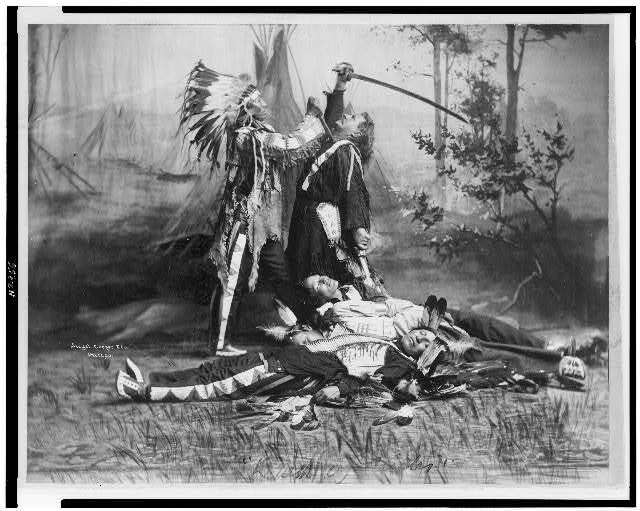 When Sitting Bull agreed to join Buffalo Bill's Wild West Show in 1885, he probably didn't realize he was about to make a major contribution to the stereotyping of the American Indian and the romanticizing of the American West in the popular imagination. Sitting Bull himself was a major attraction, as thousands of spectators turned out to catch a real-life glimpse of the infamous "Killer of Custer." A photograph of Sitting Bull with Buffalo Bill taken by William Cross in 1885 was one of the most popular souvenirs of the show. 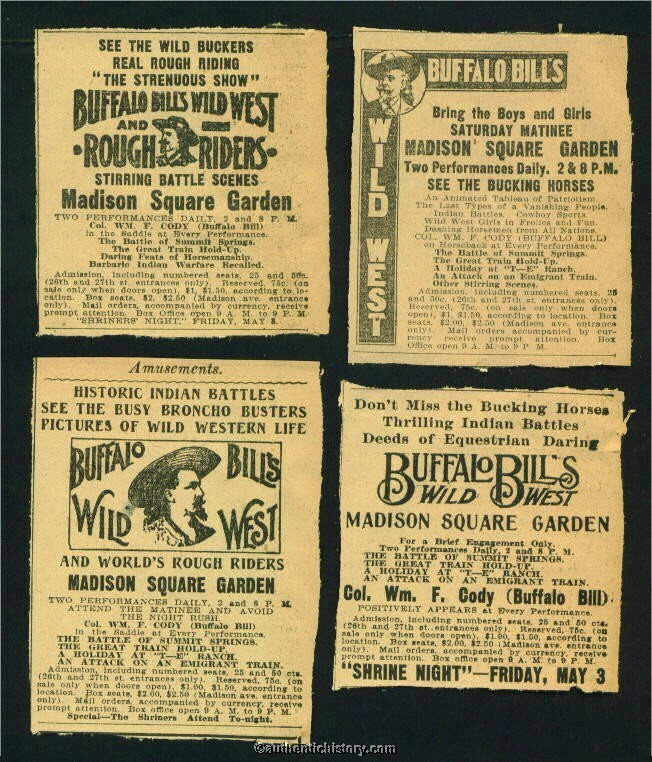 Invented in 1883 by Buffalo Bill, the Wild West Show became an enormous entertainment attraction well into the early Twentieth Century, particularly in the Eastern American cities. At the same time the real frontier was coming to a close, Eastern cities were filling up with native-born Americans and European immigrants who were wholly unfamiliar with the unique American frontier experience. Buffalo Bill and others gave it to them in the form of vaudeville-style theatrics that forever mythologized the West with their presentation of that rapidly vanishing way of life. 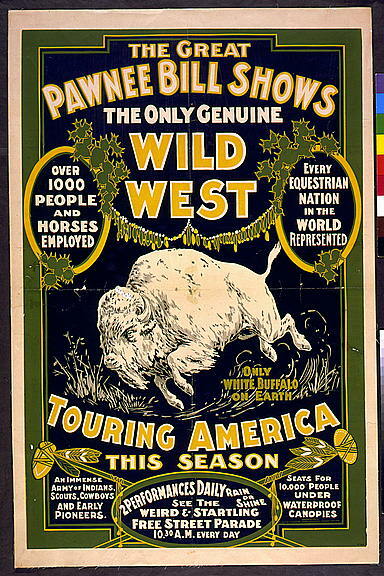 Buffalo Bill even took his show to Europe in 1886, to wild acclaim. the prairie. These reenactments were combined with displays of marksmanship and skill with rope and horse by some truly talented people, including Annie Oakley, Wild Bill Hickok, Bronco Bill, and Will Rogers. 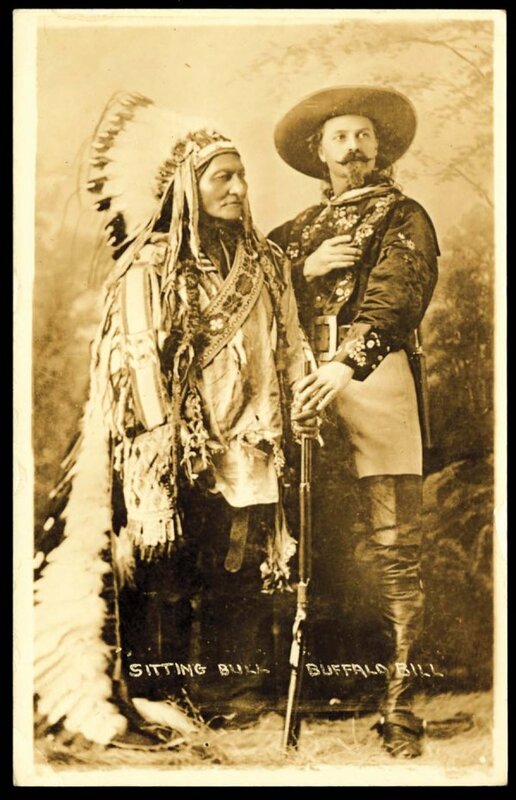 Buffalo Bill himself was said to be an excellent marksman, especially with a rifle on horseback. one of the last still surviving in the United States. 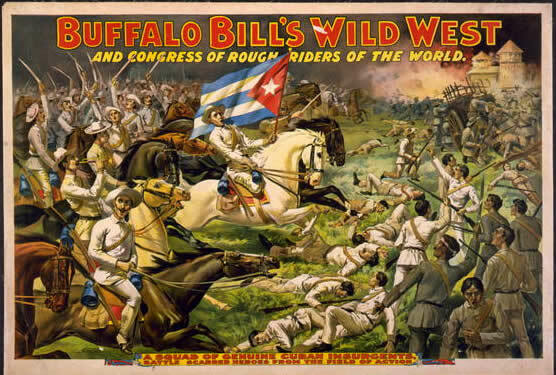 Typically, the show concluded with a grand finale, often a dramatization of savage Indians attacking and burning a White settlement, only to be repulsed by Buffalo Bill and other cowboys. 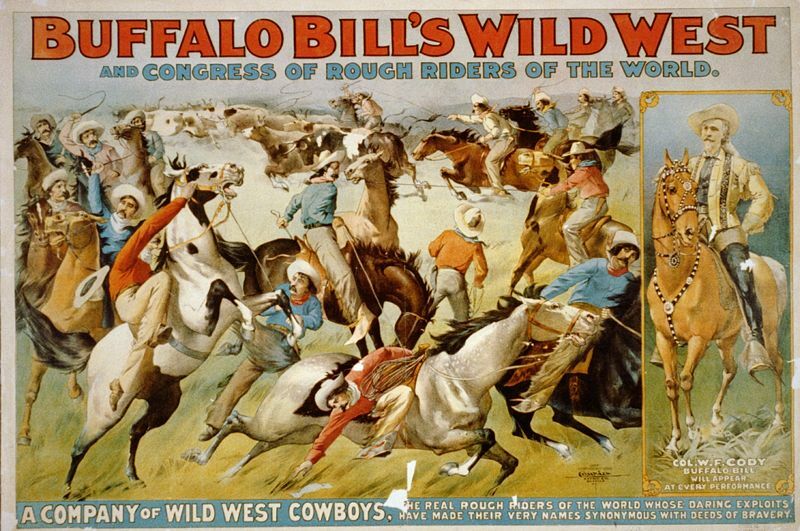 Buffalos Bills Wild West Show captivated audiences from 1883-1913. 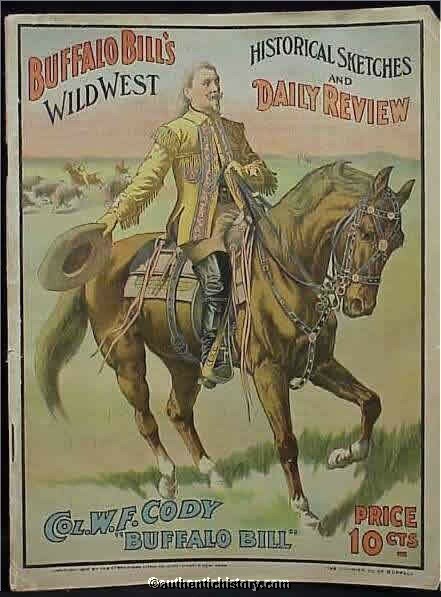 In 1887 Cody responded to a request by Queen Victoria to appear at her Golden Jubilee at Windsor Castle by taking the entire troop overseas on several ships, including 200 passengers, 97 Native Americans, 18 buffalo, 181 horses, 10 elk, 4 donkeys, 5 longhorns (Texas steers), 2 deer, 10 mules, and the deadwood concord stagecoach. The Show toured England for the next six months, and then the following year returned to tour Europe until 1892, and again in 1906. 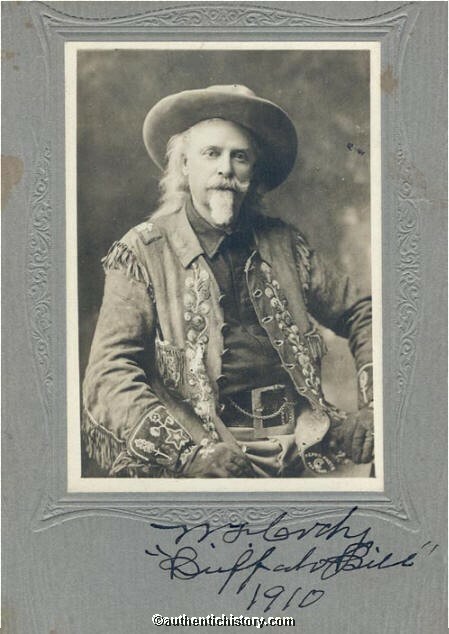 By taking his Show overseas, Buffalo Bill spread the myth of the American West to people whose frontier has been settled centuries before, and who were hungry for the exciting adventure of the American West. 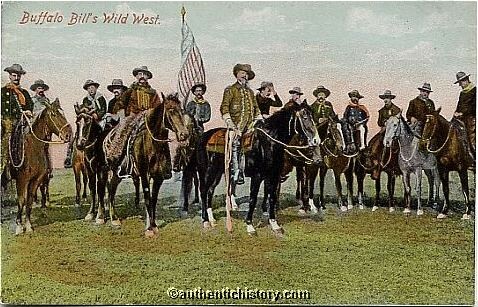 To some Europeans, the Wild West show not only represented the west, but all of America, and it likely influenced the decision of many to immigrate to the United States. Bill also created the cowboy as an American icon. He gave the people of England, France, Spain, Italy, Belgium, Netherlands, and Germany a taste of the wild and romantic west. In 1893 the show performed at the Chicago Worlds Fair to a crowd of 18,000. This performance represented the peak of the shows popularity. Thereafter, it saw a steady decline. A series of unfortunate business decisions and the poor economic climate of the country, as well as the invention of the motion picture contributed to the show's end. In 1913 Cody was bankrupt and took down his tents for the last time. 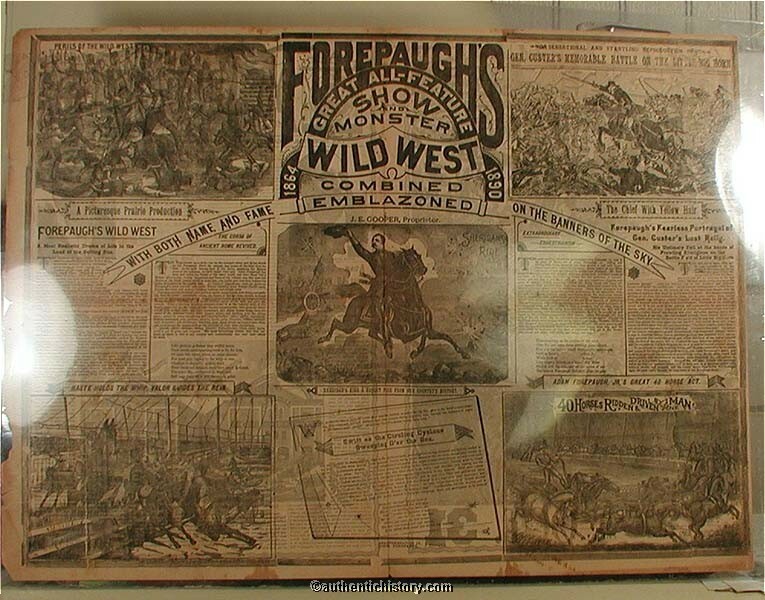 Nevertheless, the impact of Wild West Shows on the creation of a mythic past for the United States can hardly be overestimated. Not only did it serve to mythologize America's past, but it forever identified the Plains Indian and his lifestyle as the Indian, and fixed the Euro-American image of the Indian in time. 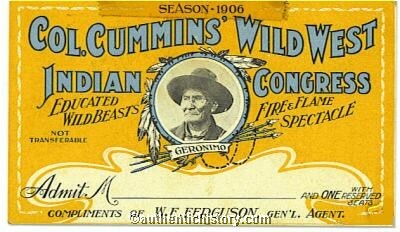 By the late Nineteenth Century, Euro-Americans were well on their way to identifying the Indian as a people of the past.